How Long Does SEO Take? So you started a blog, or you have a website, or you just want to learn how to drive more “traffic” to whatever website you have. And everywhere you look, you are constantly seeing “SEO” and sentences such as, “The importance of SEO” and “SEO is the key to your blog or website success.” Now you’ve done some research, and you’ve familiarized yourself with the SEO means search engine optimization term. But some questions remain, “How long does SEO take?” and how long until the Search Engine Optimization actually starts working and bringing more clicks and clients to your site. Well, before we answer all those questions, let’s dive into some of the common factors that play a role in how long SEO takes to work. Your content Often you’ll find yourself wondering what’s more important when it comes to your content, quality over quantity… or quantity over quality? Let me help you here a little, the answer is quality. Every time, quality content is a win. When choosing quantity over quality, you can easily get sucked into the bad habit of throwing out tons and tons of content to make yourself look super active, but then under the stress of putting out a big amount, your quality will suffer. It’s far better to have an amazing piece of genuine content worth reading, rather than a whole lot of stuff that can seem rushed or forced or worse… completely unrelated to your website. But don’t let that distract you from realizing how important it is to stay consistent! Another variable here is quality links. Google really cares about the links on your site, so make sure you always go for high quality links to and from well-established sites. High quality links have higher rankings in search engine results. Stay consistent. Not only is content consistency important, but so is the consistency in implementing your SEO plan regularly into all content you publish. I know, I know, this is no easy feat. But it’s all very worthwhile in the long run for the rankings and traffic for your site. You see, it takes hard work and dedication to be that awesome, and it’s important to be patient. So don’t forget, SEO takes time. Competition This is an important one folks! Everywhere you read, every time you research “How long does SEO take?” You’re going to notice that every professional and every expert will bring up your niche competition. It makes sense to acknowledge that if you’re a new domain in a popular business niche, it’s going to take lots of time and dedicated consistency for you to build up your brand against the already popular competitors who’ve been doing this for years and years. Do not expect that if you invest in an SEO plan that your business or blog will take off. It can however, be more effective for those who don’t have much competition at all. Still, it’s not an overnight process, and it won’t be bam – results in one month. It’s also extremely important to remember that; just because you’re hiring who you believe may be the best of the best in the SEO business, you are going to see faster results. No, keep in mind, all your competitors are already doing the exact same thing. And the longer they have been around, the longer it takes to catch up to them. 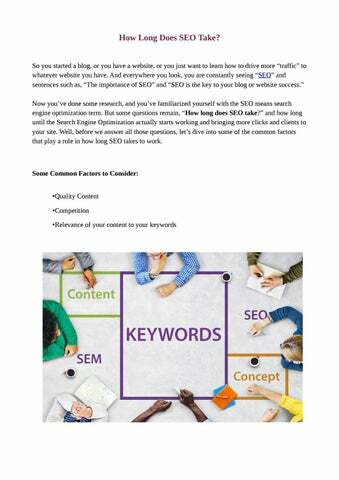 Keywords and their relevance to your content Not only is it vital that you determine the right keywords for your particular niche, it’s also very important to stay relevant to your keywords and titles. When publishing content of any kind, you don’t want to make a bad name for yourself by fooling people. Get to the point. And make sure you actually deliver the content of your title. This helps search engines like Google to acknowledge the quality of your content. Conclusion So how long does SEO take? There is NO right or wrong answer for this question, as it’s highly dependent on numerous variables. I hate to be the bearer of bad news as much as the next person, but if you really want a set expectation in mind for long it can take before you see results, well my friend, expect several months to a year. From the advice shared by Google Webmaster, Malie Ohye, It can take four months to a year to first implement improvements, and then see the benefits. And remember, consistency is extremely important in proving that you’re an active site and uploading fresh content regularly. And even better; new content means more people coming back to visit your website and see what’s new. So in a nutshell, SEO takes time. Don’t expect unrealistic results. In the meantime, maybe you should also consider practicing your patience. Read out these some of the common factors that play a role in how long SEO takes to work.